HAVANA/BOGOTA (Reuters) - Colombia's Marxist FARC rebels justified their capture of an army general in a remote jungle area as a legitimate act of war on Tuesday and urged the government to rethink its retaliatory suspension of peace talks. The two-year peace process faces its most serious crisis so far after rebel negotiators said General Ruben Dario Alzate and two others were the group's prisoners and made no offer to release them as a gesture to restart negotiations in Cuba. "The three were captured by our units because it involves enemy military personnel who were carrying out their duties in a war zone," FARC leader Jorge Torres Victoria, known by his nom de guerre Pablo Catatumbo, told reporters in Havana. "This peace delegation is willing to contribute to a prompt, sensible solution to this problem," he said. In a somber address late on Monday, Colombian President Juan Manuel Santos said talks to end five decades of war with the Revolutionary Armed Forces of Colombia (FARC) would cease until the three hostages are released by the drug-funded group. The FARC must prove they really want to end the "absurd war," he added. Santos had previously warned the FARC that it jeopardized the peace process after the abduction last week of two other soldiers, and continued attacks on infrastructure and civilians. Alzate, the highest ranking military hostage ever taken in Colombia, was captured on Sunday after disembarking from a boat traveling on a river near the city of Quibdo, Choco. A soldier and a lawyer with him were also captured. The military have dispatched troops by air, river and land to search the poor and violence-stricken jungle region that has three major rivers and large tracts of untamed coastline. Colombians, tired of the twists and turns the negotiations have taken since they began in late 2012 and the battle of wills between the government and FARC leaders, believe this could be the final blow. Rebel attacks against infrastructure as well as civilian and military targets have intensified in the last months, prompting fear the FARC is using talks as a smokescreen to bolster its forces and war strategy. "This could kill the process – it's an attack on peace efforts," said Wilfredy Barreto, a 31-year-old exporter as he lunched with friends. "If we don't get an agreement, this country will never progress." "Kidnapping is what ended the last effort for peace, so it wouldn't surprise me if this one ended the same way," said nurse Diana Rodriguez, 26, in northern Bogota. The most recent peace process with the FARC collapsed back in 2002 after the group used the breathing room of a demilitarized zone to build its fighting force, intensify its cocaine trafficking, and take hostages. The final straw came when the FARC boarded a commercial plane and seized Senator Jorge Gechem, who was held captive for six years. Latin America's longest-running war has killed some 200,000 people over 50 years. The rebel leadership on Tuesday said it is willing to work for Alzate's release but that his fate would be determined by commanders of the so-called Ivan Rios Bloc on the ground in the northwestern department of Choco. 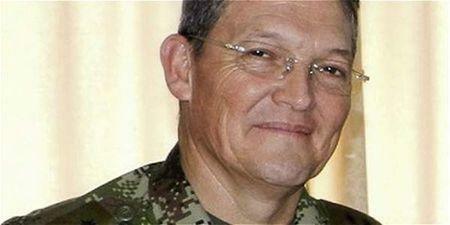 Alzate's wife Claudia Farfan, though accustomed to military life, told local media she is in shock. "I know the risks of the job, but it never crosses your mind that something like this will happen," said Farfan, whose brother and father also served in the armed forces. "I am still in shock, very worried...the only thing I do is pray." The FARC says it has stopped kidnapping for ransom but maintains military personnel are fair targets in the absence of a ceasefire. The group said it was surprised Santos suspended the talks, a decision it called "impulsive." Even while security has improved massively over the last decade or so, peace talks have been taking place amid continued conflict. The rebels on Tuesday reiterated their call for a bilateral ceasefire that would improve the climate for negotiations. Santos has been under political pressure to end the talks from right-wing critics who say Colombia should defeat the FARC militarily. Government and rebel negotiators have reached three partial agreements and until the suspension were simultaneously working on two more. Any final deal would be put before Colombians in a referendum.